Waves of militia violence and grinding poverty blight the Democratic Republic of Congo as the President delays elections; in this chaos, Catholic priests have emerged as unlikely political dissidents. Alarmed at the dire condition of life for their congregations, the priests of Congo have attempted to broker elections with the brutal regime. 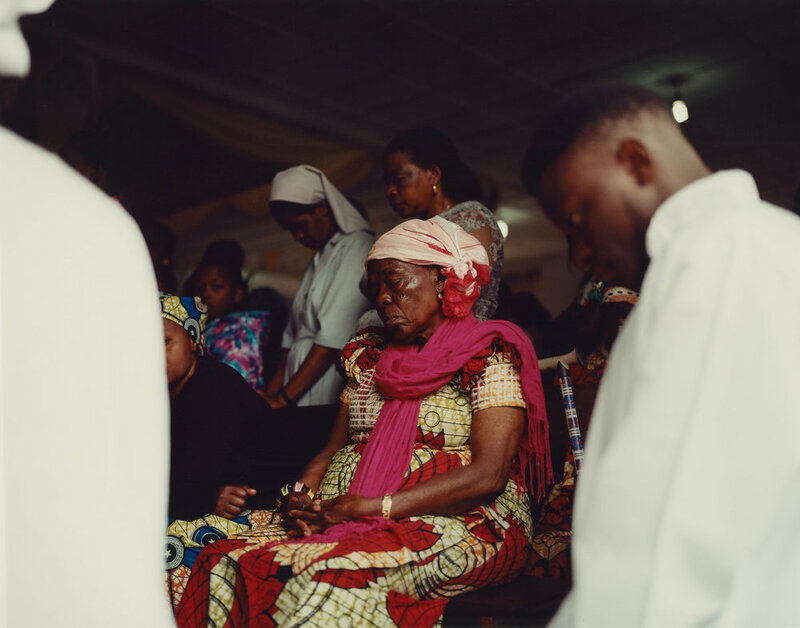 Many look to them and the rituals of the Church for guidance and assurance as Congo approaches a tipping point. Worshipper Feza Mikombe at St. Francois de la Sale, Kitambo, Kinshasa. A church heavily involved in political activism that organised street protests in the name of peaceful elections. Père Julien Wato, St. Dominique, Limete, Kinshasa. The congregation of the church of the Anuarite de Goma, North Kivu Province, Eastern DRC. Acolytes Kumu, Maleba and Booto hold the ceremonial cross of La Paroisse St. Benoit, Lemba, Kinshasa. Père Jean Nkongola, La Paroisse St. Dominique, Limete, Kinshasa. “We want to see change. We know that an election can bring peace to the country”. 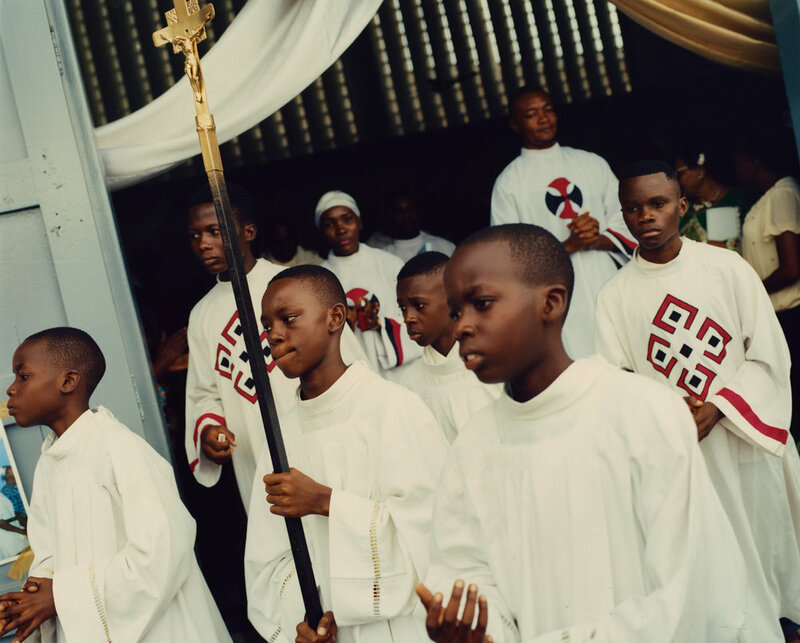 A young acolyte holds the cross of St. Dominique before Sunday service. A priest blesses acolytes and choirgirls after Sunday service at St. Benoit, Lemba, Kinshasa. The site of a recent shooting during anti-government protests. Choir girls during rehearsal at the church of the Anuarite de Goma, North Kivu Province, Eastern DRC. Choir girls practice at St. Augustin, Lemba, Kinshasa. The choir of the church of the Anuarite de Goma, North Kivu Province, Eastern DRC. 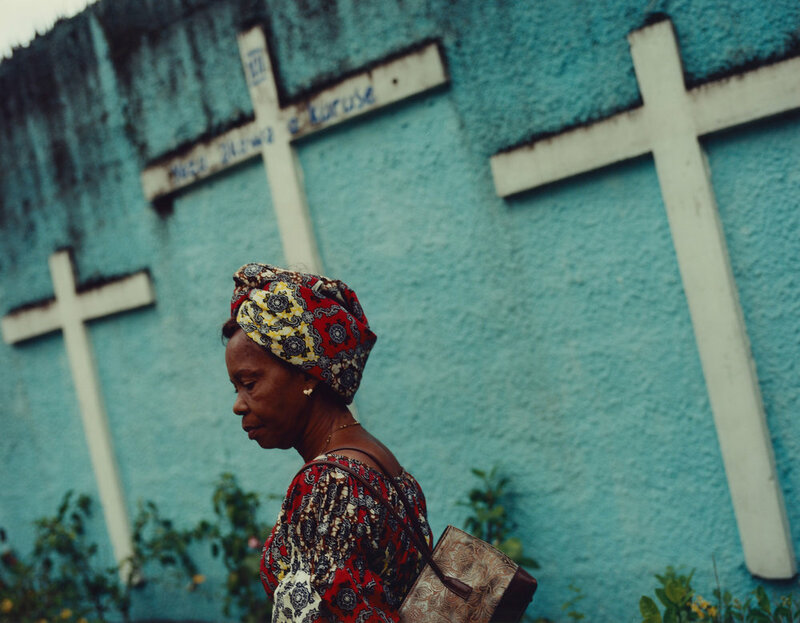 An acolyte waits with the ceremonial cross of the church of the Anuarite de Goma, North Kivu Province, Eastern DRC. Abbé Ponde leads a prayer after service at St. Augustin, Lemba, Kinshasa. “We must see the social conditions of the population change. We need a peaceful life, without trouble. We want people to live freely”. Silent prayer at the end of a Sunday service at the Anuarite de Goma church, North Kivu Province, Eastern DRC. Between Sunday services, the acolytes of Saint Dominique walk the parish grounds. Limete, Kinshasa.